You can’t spend long in fitness circles without hearing about body fat percentage. Here’s the ‘what, why and how much’ of this important figure. WHAT IS BODY FAT? DO I NEED IT? Adipose tissue (the technical term for body fat) is an efficient energy store, and is the main way that the body hoards excess calories for future use. Body fat provides insulation against heat loss and impact protection for vital organs. Fat cells also play an important role in regulating glucose storage, hormone production and blood pressure. So we would not last long without fat. WHAT IS THE RIGHT PERCENTAGE? The right fat level differs between men and women due to basic biology. The minimum healthy level for women is 10-12%, while for men it is 2-4%. Going below these percentages is not recommended except for the very short term. For general fitness, men should aim at 14-17% and women at 21-24%. Too low may actually reduce your fitness level, so balance that against the desire for a super-toned look. The usual acceptable maxima are 25% for men and 31% for women. Higher figures probably put you into the overweight category. Those smart scales that calculate body fat percentage look good, but sadly are not very accurate. A basic body fat calculator will give you a reasonable ball-park estimate. The skinfold measurement using inexpensive calipers is the most accurate method, short of body scans and being weighed in water. You certainly cannot measure body fat by looking! 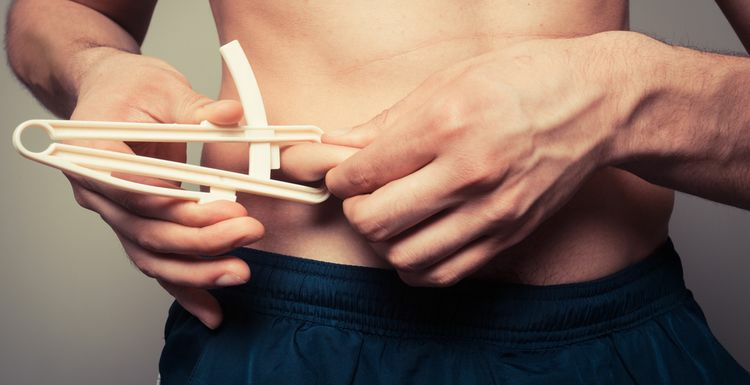 HOW CAN BODY FAT PERCENTAGE BE REDUCED? As always, it is a mix of diet and exercise. Remember that fat does not make you fat! Look to a good intake of vegetables and complex carbs, with a generous dash of other nutrients and a stern eye on portion control. Cut right back on the usual suspects of sugary food and alcohol. Fat burning equates to calorie burning, and that means moving that fat around. Concentrate on compound exercises that work major muscles, and turn up the cardio portion of your workout. There are no shortcuts to reducing body fat, but for the sake of your health as well as your appearance, keep it in the right limits and keep exercising. With unlimited access to your chosen gym you should have no trouble keeping the fat at bay! I have never measured my body fat and never intend to! The 'healthy' ranges mentioned would actually be considered 'under fat'. In fact, 2% is physiologically implausible. Al this measurement gets people unhealthily obsessed with things we're actually not designed to know. Worrying about percentages just makes the whole fitness thing less enjoyable. You definitely can't measure it by looking. A friend at my bootcamp looks very slim but she actually measured as having more body fat than me, who is, in apperance, fatter. Get yourself properly measured by a fitness instructor. the linked pictures of how various fat levels look on different people are very interesting - and somewhat reassuring!